As a marketer, you put a lot of time and effort into your work. It’s been reported that content marketing brings in conversion rates six times higher than traditional marketing. How can our content contribute to a positive experience for our audience? How can we then convert people into leads and leads into customers? Patrick Delehanty, Marketing Manager at Marcel Digital, helped our community dive deeper into the world of conversions. And Delehanty knows his stuff. He is currently the most endorsed Moz community member, after all. 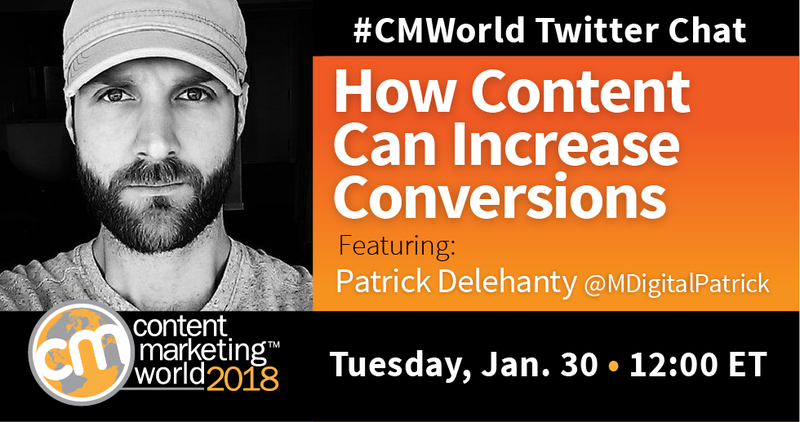 What follows are highlights from Delehanty’s #CMWorld Twitter chat. Should you track conversion on every piece of content you produce? Where would you advise someone new to conversion optimization to start? This #CMWorld chat provided great discussion! Want to see a complete list of tweets from this chat? Check out our Twitter Moment. If you’re interested in learning more about conversions, we have a track for that at Content Marketing World 2018! Register with code SM100 to save $100 at checkout.